Best known for: Frank Sinatra’s Twin Palms estate, stunning bank buildings that anchor the south end of Palm Canyon Drive, and giving Palm Springs a decisively modernist feel with visually arresting landmarks that have been savored for more than 70 years. If you’re in Palm Springs long enough, you’ll hear the story of Frank Sinatra and the home he asked E. Stewart Williams to build for him — in time for Christmas 1947. Legend has it that Sinatra walked in the architect’s office on a spring day, ice cream cone in hand, and asked for a brick-and-columns Georgian mansion. In the desert. Though it was to be Stewart’s first residential commission, he eschewed the concept but accepted the commission. He and the crooner eventually agreed on a modern home with floor-to-ceiling glass, a covered walkway, and a piano-shaped pool we know as Twin Palms Estate. With the confidence of an architect’s son and the assuredness of someone who had earned a master’s degree in the midst of the Great Depression, Stewart never swayed from his architectural instincts. Before moving to Palm Springs, he taught at Columbia University for several years, worked in the office of Raymond Loewy, and traveled extensively to see great buildings designed by those he admired (J.J.P. Oud, Walter Gropius, Le Corbusier, Erich Mendelsohn). 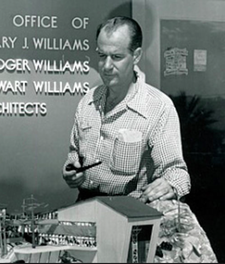 His father, Harry, had designed La Plaza Shopping Center and, in 1946, Williams joined his father and brother’s local architecture firm as Williams, Williams & Williams. The southern stretch of downtown Palm Springs is home to several of his imaginative, larger-than-life designs. Hulking masterpieces of midcentury clean lines, they are pieces of history in glass and steel. The Palm Springs Art Museum’s Architecture and Design Center, Edwards Harris Pavilion resides in the former Santa Fe Federal Savings and Loan building, a classic International-style structure designed by Williams in 1961, clad in unmistakable aluminum screens. His residential works for private clients are equally impressive. Large, inviting rooms are a flowing interplay of boxes. Stone chimneys pop up through flat plane roofs that extend far past the glass walls below, creating strategic shade inside and out. Williams stepped out of retirement to complete one last important project: a major expansion of the museum known as the Steve Chase Addition. He began designing in 1990; it was completed in 1996, when Williams was 87 years old.